Nanuq sailing just south of the Svalbard archipelago. I have been fighting a little war over these past 24 hours with some sort of yellow algae or organism. The accumulation of this yellow little thing on my really thin filter obstructed it and water couldn’t pass through it anymore! So, the first 7 litres of water were filtered almost drop by drop, then I had to change the filter to filter the remaining 3 litres. In total, it took me more than one hour. Also, to complete the misadventure: it was 4am, freezing outside, the water was at 3 degrees celcius, we had more that 1 metre waves, and there was 20 knots of wind passing through my naked, wet fingers! But on the positive side: now every other sampling since seems simple to me! Of course, we already knew this – but to see it is another thing. Even though there are no airplanes, no boats, no traces of any other human being but us… there is one this we cannot escape: human pollution. Life on board continues its routine: eating, working, reading, doing our shifts, sleeping, playing card games. But you can see that for some people, one week in a boat with 9 other people – with only sea and fog outside, and no normal life rhythm – is already enough. Fortunately, everyone staying on board for the second part of the expedition seem to be highly motivated and happy with this new rhythm! 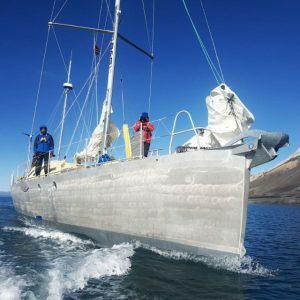 Nevertheless, we feel like we need to move a bit more, to do more exercise, and we look forward to go to Longyearbyen to swim and FINALLY have a shower! Nanuq’s has now arrived in the Svalbard archipelago, two days ahead of schedule – follow along live!